Always good to read your latest discoveries, Anita! I like new books and this one from Dorcas sounds quite intriquing! Blessings to you! If one could have a ‘bucket list’ of people they’d like to get to know I think Dorcas would be on mine. As far as I know we’ve never met, perhaps someday. I enjoy Dorcas’s writing, and would love her new book! I’ve enjoyed Dorcas’ other books so far; thanks for the chance to win this one! I would love to sit with you and chat over tea. I have good memories of being in your Christian Womanhood class at bible school. This sounds like a book I’d enjoy reading. I’d love to win her book! I have all her others. Enjoying the blog tour for her book. Finding new blogs to follow. This is an excellent preview of this book. Oh, I would love to have this book! I enjoy her books. A lot. I’m sorry about your mom, Anita…and I’d love to catch up with you sometime again! It’s been a long time since we were in second grade together… and I’d love to read Dorcas’s new book! I would love to win this book by Dorcas! Hi dear cousin! 🙂 I enjoy reading what you write. It’s always refreshing. And just recently I started reading through ‘Life is for Living’ again…….I have read some of Dorcas’s books and would love to read this one too! I love love to read Dorcas’ writings… and I would love her new book! I have her other books…and enjoy them when they aren’t loaned out to others! Dorcas has spoken wise words to me throughout the years and I treasure her friendship! Oh, I love reading Dorcas’ books! I love the way she makes you laugh and cry in the same book if not in the same chapter. Would live to have a copy! 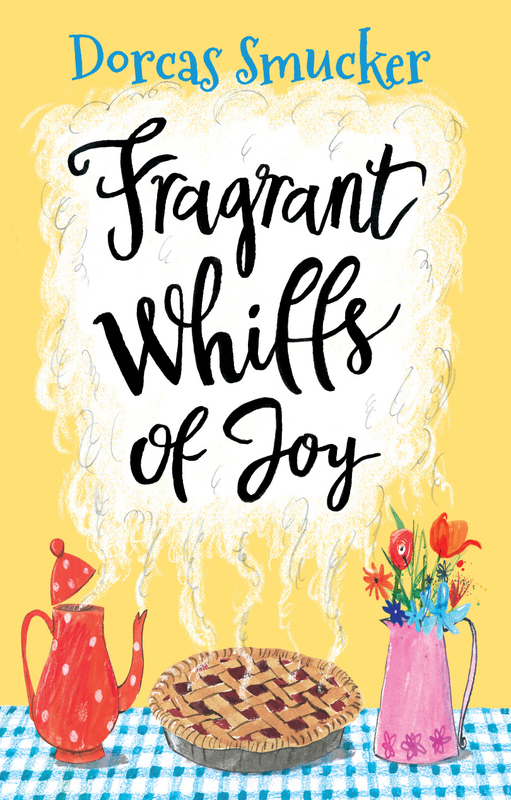 I would consider it a Fragrant Whiff Of Joy to be able to win this book! This book is on my sister’s Christmas wish list, & I told her I’d consider getting it for her if I can read it too! 🙂 If I win this one it will be enjoyed by both of us. I’ve never read any of her books but it sounds like I’d really enjoy them. Might as well begin by winning this one! Sounds like a lovely book. I’d sure like to have my name in the hat! Oh, Anita! I enjoy Dorcas’ writings, but yours are just as delicious. If I win, draw again because I can get one from our bookstore. Have you read Dorcas’ blog about the solar eclipse? Absolutely hilarious. Our family laughed till we cried at the breakfast table one morning. Bless you! Reading your post brought back memories of the time you came to our home with your sister Esther and family. We each brought a traditional Christmas food. At the moment I can’t remember what those little tarts (an Irish tradition) what those little tarts are called that Esther and you brought. Happy memories…………..
I’d give one to my mom, too….though I’m grateful hers is just painful knee trouble and not cancer. Would love for a chance of winning this book. I love her writings! I love Dorcas’ writing. And I didn’t know about your mom. So sorry to hear that! Would love to enter the drawing. I think I’ve read all her books–maybe missing one. Love Dorcas’ writing and would love to read this book! I love Dorcas’ writing, and yours! I would love to win this book! I’m thankful for inspirational writers like you n Dorcas… I enjoy both of your blogs n books 👍I’d love to enter the giveaway! I love reading Dorcas and your blogs! Both of you inspire me! I’ve been a fan of her writing for years. Of course I’d love to win! Reading this book would be delightful. I love love love Dorcas’ books! Thanks for the opportunity to win one! I enjoy Dorcas’ books and I’d love to win this new one. Your books n posts are so inspiring! Keep it up!!! I love reading your blog and your book reviews have inspired me to buy books before. Maybe this is one I should read too! Ooh, this book sounds like a fun read. I would love to have a copy of this book. It sounds delightful. If it’s you who introduced me to Dorcas Smucker’s blog, thank you! I found it so delightful that I read way, way back into the archives. PS You’re invited to tea at my house next! Keep writing! Your posts (and your book) inspire me so much! I love your honesty, it resonates with my heart! I’d love to read this book! I would also love a copy of this book! I also have a question for you: You’ve self-published a book; how did you go about doing that, and how do you go about selling your book? I have a story I’d like to publish, and I’ve reached out to several publishers, but have only heard back from one, who rejected my story. Any advice or tips would be greatly appreciated! Just the few tidbits that you posted of Dorcas’ book were full of relevance to my life…her books are always like that, and I read them over and over as the years go by. Glad to now also discover your writing too! Her books are so captivating – would love to add this to my shelf! I am jealous that you get to live with one of my very good friends… and I would really like to read this book! And I would like to finally win something in an online drawing…. Oh Anita – I am so sorry about your mom and welcome you to the “Daughters of Moms with cancer” Club with a hug from me to you and a tear in my eye. It’s not a club any girl wants to join but it’s a club where the mother/daughter bond is strengthened, treasured and given great priority. I didn’t know you had a blog or were published – it’s been such a long time since we chatted and your book was still a dream. I would love to read your book. Where could I buy it? I would also like to introduce my mother to Dorcas’ latest book and will gift it to her if you choose to share it with me. Thanks and have a wonderful Thanksgiving and Christmas season with your family. I just reviewed your blog and realized you are not the Anita Yoder I know (Mennonite names seem to cross pollinate). I am still sorry about the “Daughter of Mom’s with cancer” Club – my mother has been fighting pancreatic cancer for 3 1/2 years. May you find grace and an abiding joy as you encourage your mother on this journey. I have read and l loved most of her other books. I love how she captures the joys of the everyday in her stories, and pulls out life lessons from seemingly insignificant moments! I always value your reading recommendations. Since this author is a fave of mine this one’s a double win. I read Dorcas’s blog and an happy to find yours! Hey! 😊 My mom knows Dorcas a bit and I’ve heard good things about her; we have two of her books (one is “Upstairs the Peasants are Revolting” 😁) and the whole family enjoys them. Thanks for doing this giveaway! It’s interesting to see all the comments so far and how many people I know. Thinking of/praying for your mom! I would love to read this book….sounds very interesting. You do a good job of reviewing books. I am blessed to call Dorcas a friend. My son installed her Internet! And they both sent the picture to prove it. Oh, yes please! I’d love to read this book. I always enjoy your posts– and Dorcas Smuckers. I would love to read this book– and yours, too, if you publish another! I have read one of Dorcas’ books that was borrowed from a friend. I would like a chance to win one but if I don’t , I’ll purchase in the very near future. I would love to win this book. I’m a fan of her writing! I’m curious, just the title of Dorcas’s book is enough to get me interested! I’ve wondered before if you ever considered writing a book especially for teenage girls (I am one). About guys, dreams and how to deal with all the feelings and emotions of this time in life. Make sense? I read my older sister’s copy of Life is For Living, and was blessed. Oh I’d love to win. I love to read your writings, Anita, and also Dorcas’. Will miss you this Thanksgiving…and BTW I ordered the book Well you recomended after reading your post. Sounds like something I’d love:) blessings…. I’d also enjoy this book! I’ve been wanting to read her books for a while now! I would love to win! And thanks for not making us share our cakes and deepest fears. I don’t know who cares about the cakes 100 random internet strangers like to eat anyway. Thanks for writing this book review. I love your book Life is for Living not just waiting around. I would love to win this new book by Dorcas. I’d love to read this latest book since I’ve read all of Dorcas’s other books! Would be delighted to have her latest book! Would love to add this book to my library. As i read your blog the words of Francis Bacon came to mind. . . “Some books are meant to be tasted, others to be swallowed, and some few to be chewed and digested; that is is, some books are to be read only in parts; others to be read but not curiously; and some few to be read wholly, and with diligence and attention.” I can tell you digested this book and now you’re whetting our appetites. Thanks, Anita! I love her writing style. Love her wisdom and writing and books and delightful titles! I have read Dorcas’ blog for years and have the first 4 books. This quote:” We cannot go wrong with honesty and love, with flaws and laughter, with genuine joy or sadness. We would love to fix the world by distributing perfect solutions at arm’s length, but what people really need is for us to walk beside them until they figure life out for themselves.” made me think of my friend that is walking with me in my hard journey right now. I would love to have this book to be able to bless her with it for all she does for me. The book sounds delightful and I don’t usually do comments! Actually I’d thought of commenting on your last one about Sarah Thebarge’s books because I needed to hear the comment about giving compassion and love being just as important here where I am now as it was in the places I used to live. I’ve gotten through the first year of adjustments to living in the US and I’d say a lot of things feel more normal now. But there are different more long term adjustments that have to be processed in year 2. So I’m in that now! The good thing is that each phase keeps pushing me on toward knowing God… seeing my need of HIM again and again. Blessings for sharing bits of your journey! I’d enjoy the chance to read this book. Dorcas’ writing is liking eating a delicious brownie, rich and decadent but not unattainable to bake. I’m delighted to hear she has released a new book! Put my name in the drawing too, please:) really enjoy Dorcas’ books and blog. I Also have your Life is For Living book, Anita. Excellent job. I’d love to read Dorcas’s new book! Also, I enjoy your blog. You have a way of saying profound things in a simple way. I’d love to have this one of Dorcas’ books! I always love reading a new book! I love Dorcas’ books. She can always make you smile and think: two very important things. I’ve recently discovered Dorcas’ blog….possibly through you, though I can’t quite remember the connection. I would love the chance to read one of her books! Any cake is a favorite if it is served with ice cream! And the best book is the one I am currently reading. If it were not so, I wouldn’t keep reading it! I have never read any of Dorcas’ s books because I just dis overed her this evening, but I have spent the last hour reading her blog. If I don’t win it I’ll buy it! 🙂 Thanks Anita. I’ve been thinking about buying some more of Dorcas’ books. I’ve only read one so far, and greatly enjoyed it. Didn’t realize she just wrote a new one, though. So thanks for telling us about it. I teach. And I’ve just spent 2 1/2 hours after school visiting with several lovely young ladies. The main topic of discussion was writing/favourite authors/blogs/books/how to inspire students to write, etc. and I left with one of my “writing inspirations” fever. Such a delightful dilemma to have! Someone mentioned Dorcas Smucker, which is what makes me excited about this book! I love the title! What gives me a whiff of joy? Reading beautiful, captivating stories written by my students. Short and sweet… I miss you! Reading your blog made me miss you all over again! I have happy memories of us sitting on the bluff/field in Ireland watching the wild sky, the Irish Sea, and the sheep racing down their trail toward home!